This was an interesting read and a difficult book to rate and review. First off, this is YA. The category of YA is pretty wide open, but it follows a couple of YA tropes. First off, the protagonists are teens. That a requirement for YA. Secondly, the parents are out of the picture. Dead; checked out — a pretty classic device in this style of book. And of course NObody understands the teens. Except one person, who recruits them to play a bunch of video games. Ani is good at software design and Tyler is really good at playing video games. So this guy Rick hires them both (and a few others [but they don’t really matter]) to work for him. Ani and Tyler kind of have a thing for each other, but Rick forbids them getting together. Ah…forbidden love. Another trope. Of course Ani and Tyler hook up and then they discover that Rick isn’t being completely upfront with them. They aren’t just playing video games … they are controlling real life drones and killing people for real! Rick knows they know. Can they get the word out and stop this atrocity before Rick puts a stop to them? Playing a video game that isn’t really a video game has become too easy of a plot. Orson Scott Card did it most notably, and perhaps best of all, with his “Ender” books, and I’ve read other stories with this theme and they all come off as hackneyed works on Card’s theme. The romance between Tyler and Ani starts off feeling quite real and believable … neither is confident that the other is interested. They sort of dance around the possibilities while daydreaming of one another. But something changes pretty quickly and Tyler, the quite video-playing nerd becomes a cocky, self-assured romance jerk. He becomes the guy who is usually written as the uncaring, self-absorbed prick. Author T.L. Costa tries to rein him in by having him constantly question whether or not Ani cares for him, but his actions show him as something quite different. The savvy reader picks up on what’s really going on long before Tyler and Ani do, which makes some of the middle portion of the book move a bit slowly. But once the pair pick up on what’s happening, the action takes off again at a rapid pace. So why is this a difficult book to rate and review? Because despite all the drawbacks, Costa has written a pretty moving thriller. The reading is easy and swift and Costa’s wordsmithing is pretty sharp. While reading it, I was kept drawn in. It was after I would stop and think about what I had just read when I would realize the tropes and the creepiness of the sexual encounters. This seems targeted toward male teens since Tyler is a primary voice and he’s playing video games, but the chapters are written such that half the time we get it from Ani’s point of view. It’s a little odd, given the material. I don’t think this is the typical teenage girl draw. I’ll give this a slightly better than average ranking, but I can’t quite recommend it. Looking for a good book? 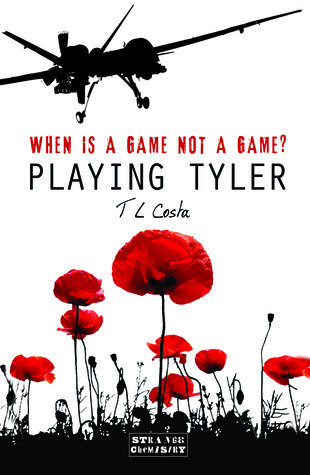 For a YA book, Playing Tyler by T.L. Costa has a bit going for it, but it relies on some over-used themes and some creepy confidence that may not appeal to many.